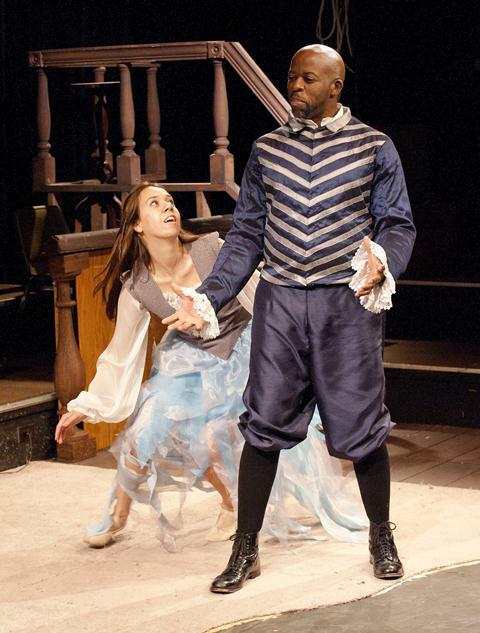 Southern California Shakespeare Festival, a professional company in its 8th season operating under an Equity guest artist contract at Cal Poly Pomona, is continuing performances of The Tempest through September 30. The Festival is known for its non-traditional casting and this year, African American actor Michael Kachingwe is playing the sorcerer, Prospero, a role that usually goes to an older white man. Last year, Kachingwe played Queen Margaret opposite Lisa Wolpe as the King in Richard III. In addition to Kachingwe, the multi-ethnic cast, directed by Sam Robinson, includes Dani Ramos, Phoenix Lee, Kiersten Tanopo, Andrea Lopez, Marissa Pitts, Adriana Flores, Andy Nguo, Kimberlee Stone, Jorge Flores, Job Barnett and Luis Arredondo. The production team for the The Tempest includes – Costume designer: Corinne DiTullio. Set and sound designs: David Montanez. Lighting design: Jessica Gallegos. Festival Artistic Director: Linda Bisesti. Performances are Saturdays at 8pm and Sundays at 2pm. Also Friday, September 21 at 8pm at the Studio Theatre on the campus of Cal Poly Pomona, 3801 W. Temple Ave., Building 25, Pomona , CA 91768. Tickets are $15. Seniors, students, faculty, staff: $12. For reservations please call (909) 869-3800 or go to www.southerncaliforniashakespearefestival.org. I would love to be a part of a shakespeare production. I am an actor and I would really like an opportunity to audition for roles posted on the site, I am very confident I have the talent and I have experience to confirm my skills.